A new research study, published this week by an international team of climate scientists in the journal Nature, isolates key mechanisms that cause El Niño events to differ. The team found that the complexity and irregular occurrence of El Niño and La Niña events can be traced back to the co-existence of two coupled atmosphere-ocean oscillations, with different spatial characteristics and different frequencies. "Our study reveals that there is a hidden structure in the seemingly chaotic and unpredictable occurrence of El Niño events," said Axel Timmermann, Director of the IBS Center for Climate Physics (ICCP) at Pusan National University and lead author of the study. El Niño events are characterized by an unusual warming of the central to eastern equatorial Pacific, which can last up to one year. Many events subsequently transition to a La Niña (cold) state, with a typical duration of one to two years. El Niño events, which tend to peak in boreal winter, typically lead to a drying of Southeastern Asia and the Western tropical Pacific while enhancing rainfall near the eastern Pacific shores in countries such as Ecuador and Peru. El Niño's remote "ripple effects" can not only be found in the atmosphere, but also in ocean currents, ecosystems, the occurrence of natural disasters, global markets and national economies. 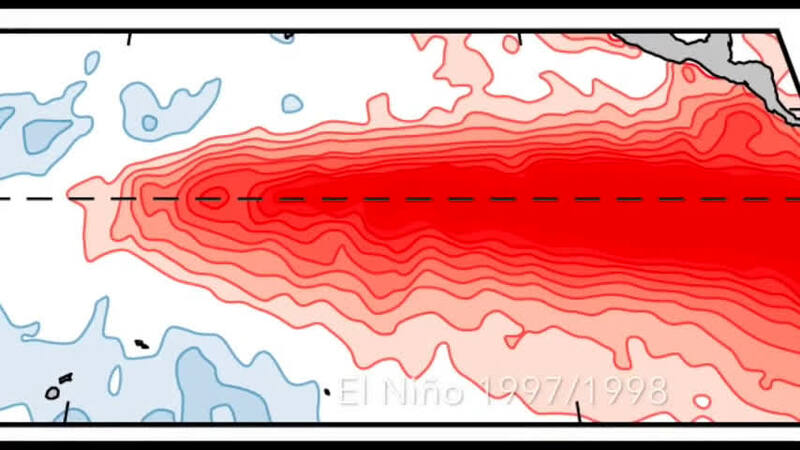 Climate scientists have long recognized that not every El Niño is alike. Some are weak, others are strong. Some occur in the central Pacific, others in the east. These differences will determine which areas will be hit hardest by climatic extremes and which ones will be spared. Accurately predicting El Niño events requires a deeper understanding of its diversity or as some scientists call it—its "flavors." To elucidate the origin of El Niño diversity, a group of 40 climate scientists from 11 countries met in October last year at the IBS Center for Climate Physics and Pusan National University, South Korea. Analyzing large amounts of climate observations and computer model simulations, the team unraveled the mechanism behind El Niño's capricious behavior. When the upper tropical Pacific Ocean stores more heat, El Niño events tend to peak in the Eastern Pacific and during boreal winter, whereas a cooler upper ocean system leads preferably to the development of Central Pacific El Niño events, which exhibit a weaker seasonal coupling. 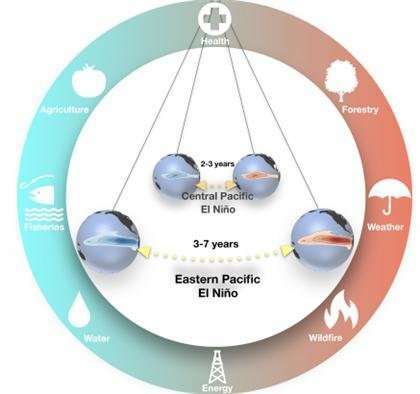 By running El Niño computer model simulations for different temperature, wind and ocean current configurations, the research team found that Eastern Pacific El Niño events are characterized by a return time of three to seven years, whereas Central Pacific events tend to recur on average every two to three years (Figure 1). The different character of these modes is determined by how strongly the atmosphere and ocean interact with each other. In the observations, however, the co-existing Eastern and Central Pacific warm/cold swings are far from periodic. The tropical Pacific climate systems requires additional excitation, either through random weather events or through atmospheric circulation changes induced by temperature changes in the Indian and Atlantic Oceans. These interactions are an important source for El Niño irregularity, and limit how far ahead Tropical Pacific climate anomalies can be predicted. "Finally, we can attribute the observed complexity of the most powerful natural climate engine to the co-existence of two oscillatory states of the underlying mathematical equations," said Fei-Fei Jin, professor for atmospheric sciences at the University of Hawai'i, U.S., and co-author of this study. "More comprehensive climate modeling studies have to be conducted now to test our new ideas in a more realistic setting and to determine whether we can expect shifts in El Nino characteristics in our warming world," said Jeongseong Kug, one of the coordinating lead authors of the study and professor at Pohang University of Science and Technology, South Korea.